Cashew is the common name for a tropical and subtropical evergreen tree, Anacardium occidentale (syn. Anacardium curatellifolium), in the flowering plant family Anacardiaceae (sumac family). It also is the name for the commercially important kidney-shaped, nut-like seed of this plant, which is edible when roasted or cooked. 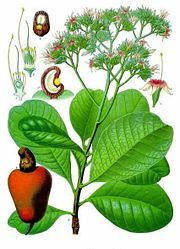 While the seed of the cashew plant serves the purpose of reproduction for the plant, it provides various nutritional values for other animals, including humans. However, it has taken human creativity to develop means to prepare this seed for consumption, since it naturally is surrounded by a caustic substance that can blister the skin of people. This creativity likewise is reflected in the use of other many parts of the plant, including the "cashew apple," the wood, and even the caustic resin itself. Anacardiaceae occidentale is native to tropical Central and South America, notably northeastern Brazil, where it is called by its Portuguese name Caju (the fruit) or Cajueiro (the tree). It is now widely grown in tropical climates, including parts of Africa and Asia, for its cashew "nuts" and "cashew apples" (see below). 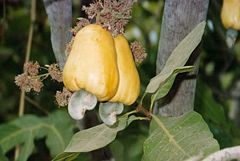 The cashew is a small evergreen tree (or shrub) growing to ten-12 meters tall, with a short, often irregularly-shaped trunk. The leaves are spirally arranged, leathery textured, elliptic to obovate, four to 22 centimeters long, and two to 15 centimeters broad, with a smooth margin. The flowers are produced in a panicle or corymb up to 26 centimeters long. Each flower is small, pale green at first, then turning reddish, with five slender, acute petals seven to 15 millimeters long. What appears to be the fruit of the cashew tree is an oval or pear-shaped accessory fruit or false fruit that develops from the receptacle of the cashew flower. Called the cashew apple (better known in Central America as "marañón"), it ripens into a yellow and/or red structure about five–11 centimeters long. In botany, a fruit is the ripened ovary—together with seeds—of a flowering plant. The term false fruit (pseudocarp, accessory fruit) is sometimes applied to a plant structure that resembles a fruit, but is not derived from a flower or flowers. The true fruit of the cashew tree is a kidney or boxing-glove shaped drupe that grows at the end of the pseudofruit. Actually, the drupe develops first on the tree, and then the peduncle expands into the pseudofruit. Within the true fruit is a single seed, the cashew nut. Although called a nut in the culinary sense, in the botanical sense, the fruit of the cashew is a seed. The true fruit, however, is classified as a nut by some botanists. The seed is surrounded by a double shell containing a caustic phenolic resin, urushiol, a potent skin irritant toxin also found in the related poison ivy in the sumac family. Some people are allergic to cashews, but cashews are a less frequent allergen than some other nuts. The seed kernal, cashew apple, wood, and caustic resin urushiol are utilized. The cashew apple is used for its juicy but acidic pulp, which can be eaten raw or used in the production of jam, chutney, or various beverages. Depending on local customs, its juice also is processed and distilled into liquor or consumed diluted and sugared as a refreshing drink, Cajuína. Ripe cashew apples also make good caipirinha. In Goa, India, the cashew apple is the source of juicy pulp used to prepare fenny, a locally popular distilled liquor. In Nicaragua, the cashew apple has many uses; it often is eaten or made into juice and also processed to create sweets and jellies. Other uses in Nicaragua include fermentation to produce wine and home-vinegar (Vianica 2007). The cashew apple contains much tannin and is very perishable. For this reason, in many parts of the world, the false fruit is simply discarded after removal of the cashew nut. The seed is the chief commercial value of the cashew. However, the brown, caustic phenolic resin, urushiol, is between the two shells and can blister skin that it contacts. The urushiol must be removed from the dark green nut shells before the seed inside is processed for consumption; this is done by shelling the nuts, a somewhat hazardous process, and exceedingly painful skin rashes (similar to poison-ivy rashes) among processing workers are common. In India, urushiol is traditionally used to control tamed elephants by its mahout (rider or keeper). The so-called "raw cashews" available in health food shops have been cooked but not roasted or browned. A light-colored oil can be extracted from the seed as well, for culinary use. Cashew nuts are a common ingredient in Asian cooking. They can also be ground into a spread called cashew butter similar to peanut butter. Cashews have a very high oil content, and they are used in some other nut butters to add extra oil. Cashews contain 180 calories per ounce (six calories per gram), 70 percent of which are from fat. The caustic, phenolic resin contained within the shell casing of the cashew, which also is known as Cashew Nut Shell Liquid (CNSL), has a variety of industrial uses, which were first developed in the 1930s. CNSL is fractionated in a process similar to the distillation of petroleum, and has two primary end products: solids that are pulverized and used as friction particle for brake linings, and an amber-colored liquid that is aminated to create phenalkamine curing agents and resin modifiers. Phenalkamines are primarily used in epoxy coatings for the marine and flooring markets, as they have intense hydrophobic properties and are capable of remaining chemically active at low temperatures. The wood of the cashew plant can be used for construction of shipping crates and boats, among other products. The sap can be used as an insecticide and in making a varnish used to protect books and wood from insects. Originally spread from Brazil by the Portuguese, the cashew tree is now cultivated in all regions with a sufficiently warm and humid climate. Cashew is produced in around 32 countries of the world. The world production figures of cashew crop, published by the United Nations Food and Agriculture Organization (FAO), was around 2.7 million tons per annum. The major raw cashew producing countries with their production figures in 2005 (as per the FAO) are Vietnam (960,800 tons), Nigeria (594,000 tons), India (460,000 tons), Brazil (147,629 tons) and Indonesia (122,000 tons). The total global area under cultivation of cashew is around 35,100 km². India ranks first in area utilized for cashew production, though its yields are relatively low. The world’s average yield is 700 pounds per acre (780 kg/hectare) of land. Cardolite. 2007. Concise history of the commercialization of cashew nutshell liquid. Cardolite. Retrieved August 6, 2007. Morton, J. F., and C. F. Dowling. 1987. Fruits of Warm Climates. Miami, FL: J.F. Morton. ISBN 0961018410. Vianica.com. Nicaraguan fruits. 2007. Retrieved August 6, 2007. This page was last modified on 2 April 2008, at 04:13.